Sat., 23 Nov. - Sat., 30 Nov. Sat., 16 Nov. - Sat., 23 Nov.
Wed., 11 Sep. - Fri., 20 Sep.
Wed., 13 Nov. - Thu., 14 Nov. Sun., 13 Oct. - Wed., 16 Oct.
Fri., 6 Dec. - Tue., 10 Dec. Sun., 22 Sep. - Fri., 27 Sep. Tue., 8 Oct. - Fri., 11 Oct. Mon., 30 Sep. - Fri., 4 Oct. Tue., 11 Jun. - Thu., 13 Jun. Sat., 5 Oct. - Sat., 19 Oct. Mon., 30 Sep. - Thu., 3 Oct. Mon., 15 Jul. - Fri., 19 Jul. Wed., 9 Oct. - Tue., 15 Oct. Tue., 24 Sep. - Fri., 27 Sep. Mon., 17 Jun. - Wed., 3 Jul. Mon., 4 Nov. - Fri., 15 Nov. Tue., 1 Oct. - Tue., 8 Oct. Tue., 3 Sep. - Sat., 7 Sep. Sat., 5 Oct. - Mon., 14 Oct. Tue., 18 Jun. - Wed., 3 Jul. Wed., 21 Aug. - Thu., 29 Aug. Mon., 25 Nov. - Sat., 30 Nov. Sun., 7 Jul. - Tue., 9 Jul. Sat., 23 Nov. - Tue., 26 Nov.
See all 1,329 properties in McCarran Intl. Great place to vacation and have fun! The staff was very friendly and the available shows and events were amazing. Love the pyramid structure ... and the pool .. beautiful .. The rooms were great- it is a bit of a hike to the elevators if you are at the end of a hallway. There were lots of kids- I would recommend opening the adult only pool earlier. Huge with everything you could ever want to see and do. Many different dining options and places to grab a quick drink. Pool area was huge. Room was great and staff were very helpful. WE ARE BIG DOG - Lgbtq - 420 Friendly! Situated in Las Vegas, this romantic villa is within 3 mi (5 km) of Thomas and Mack Center, University of Nevada-Las Vegas, and MGM Grand Casino. Park Theater and T-Mobile Arena are also within 3 mi (5 km). 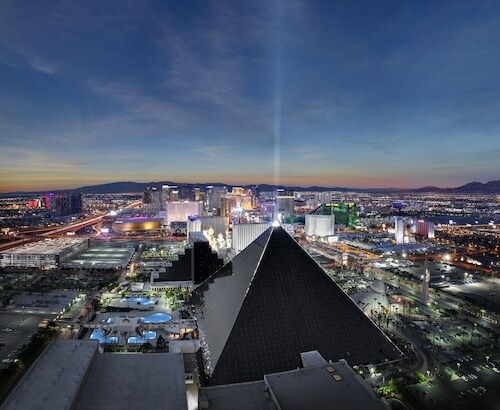 Question : What is the cheapest date to fly to Las Vegas? 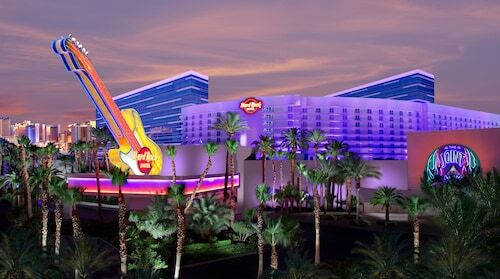 Answer : As of Apr 22nd, the best day for deals to Las Vegas (LAS) is May 21st. A ticket will put you out $234, which is 56% less than the average price to book the same route. Question : How many flights are there per day from Edmonton to Las Vegas? Answer : The number of flight times varies by day of the week, but on average, YEG to LAS sees four different options. The average route departing Canada currently has six different flight times per day, so expect fewer choices than you're used to. 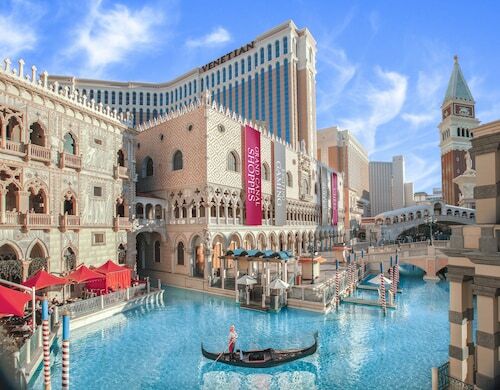 Question : How much is a plane ticket to Las Vegas (LAS) from Edmonton (YEG)? Answer : Cost can range anywhere from $234 to $2,530, prices for YEG to LAS do fluctuate much more than the majority of routes from Canada. Prices are usually cheaper the further out you book. Answer : Yes, you can adjust your departure or arrival date. If you wish to save some funds in doing so, the cheapest day to fly in May is Sunday. Being flexible with your travel days can provide you extra savings when booking. Question : What is the cheapest airline flying from Edmonton to Las Vegas? Answer : Air Canada is offering the best deal at $234. Better take a look quickly because prices range all the way up to $2,530 over the next three months. Question : Which airline has the least delays from Edmonton to Las Vegas? 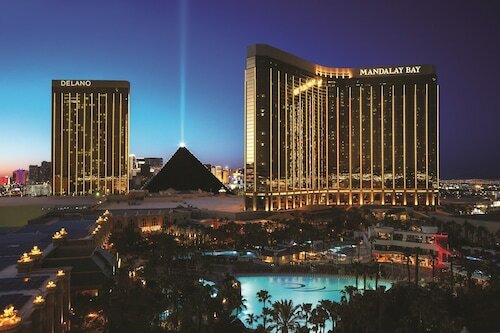 Answer : Booking with WestJet means you will arrive to Las Vegas around the time you were supposed to. In fact, this airline has a 79% on-time average. Of course, it never hurts to be prepared. If you’re on World Airways, be sure to sign up for the delay notifications to stay up to date with your flight’s status. Answer : The cheapest day to fly from Edmonton to Las Vegas is on Sunday. So, if you want to save a little money on your next business trip look for flights on that day.